More Than 4,000 Dead In Nepal As Earthquake Toll Rises : The Two-Way Aftershocks are rattling survivors' nerves and making the recovery even more challenging. In one district, 400,000 people were affected by the quake and more than 4,000 homes are now unsafe. 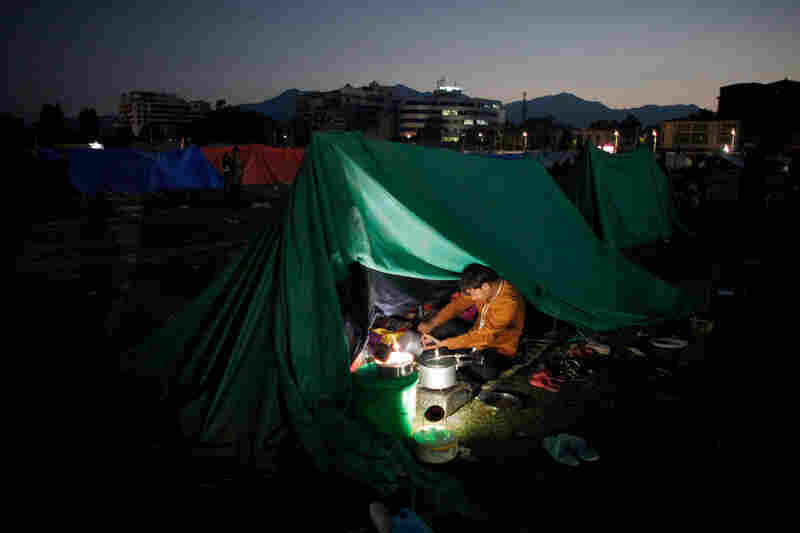 A Nepalese man cooks food inside a tent as people relocate to open ground from fears of earthquake tremors in Kathmandu, Nepal, on Monday evening. 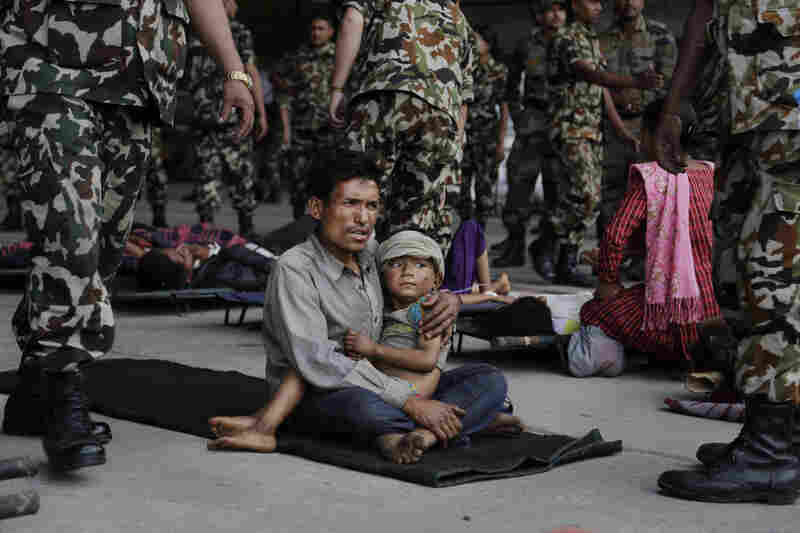 A man and child wait for ambulances after being evacuated at the airport in Kathmandu, Nepal, on Monday. 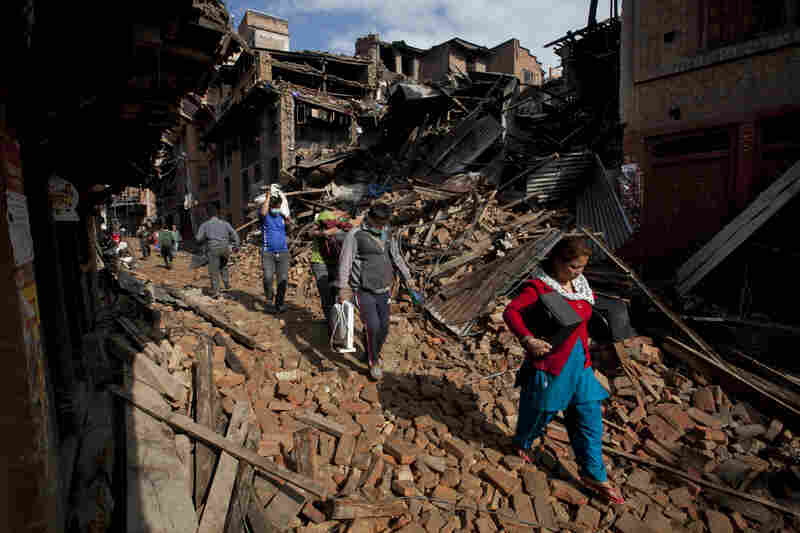 The devastating earthquake that hit Nepal on Saturday is now blamed for at least 4,000 deaths. People are stuck in a traffic jam caused by a landslide in Kurintar. International aid efforts are underway, but aftershocks are rattling survivors' nerves and making the recovery even more challenging. 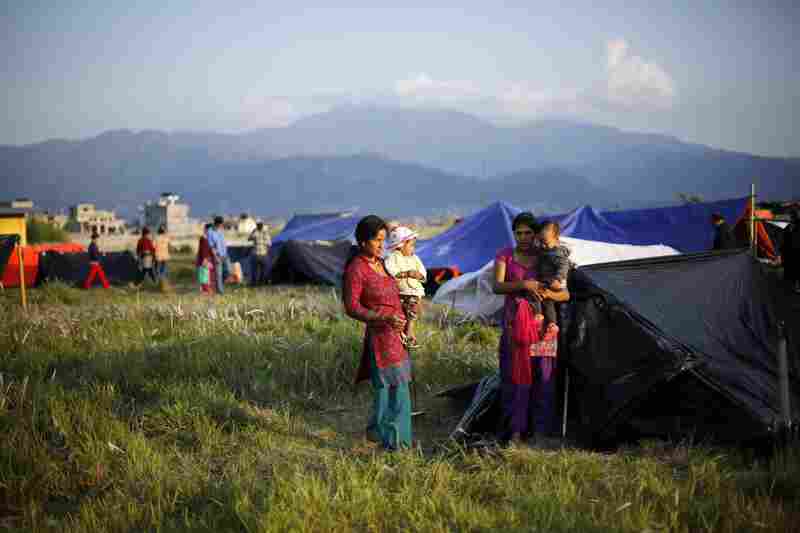 Displaced families set up tents in a field opposite the airport in Kathmandu. In one district, 400,000 people were affected by the quake and more than 4,000 homes are now unsafe to inhabit, NPR's Julie McCarthy reports. Volunteers clear the debris of a collapsed temple at Basantapur Durbar Square in Kathmandu. The area's reconstruction costs are estimated to be in the billions. 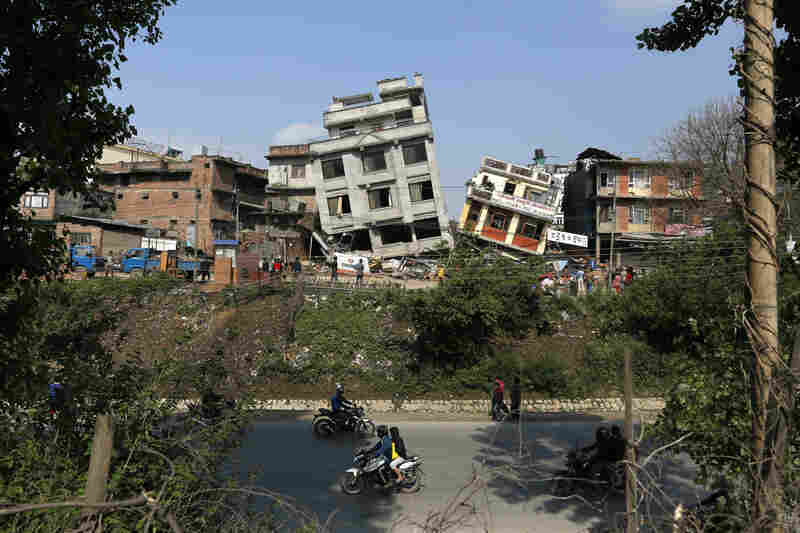 Damaged buildings tilt precariously in Kathmandu. 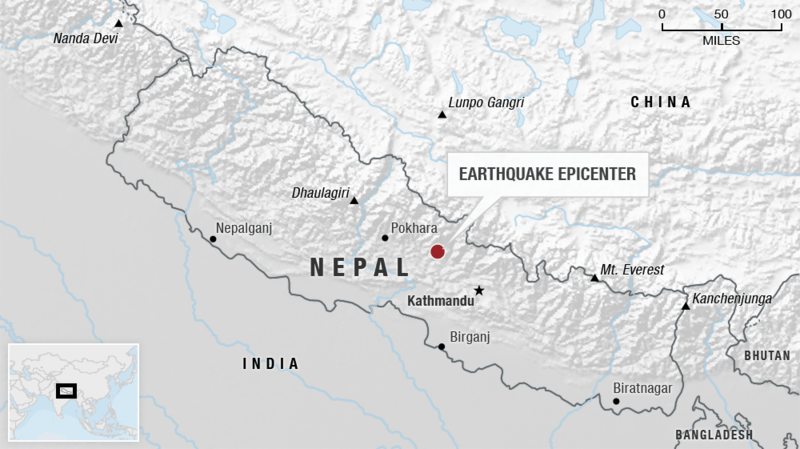 The magnitude 7.8 earthquake shook Nepal's capital and the densely populated Kathmandu Valley, causing extensive damage. Nepali volunteers unload supplies brought by an Indian air force helicopter for victims of the earthquake at Trishuli Bazar in Nepal. 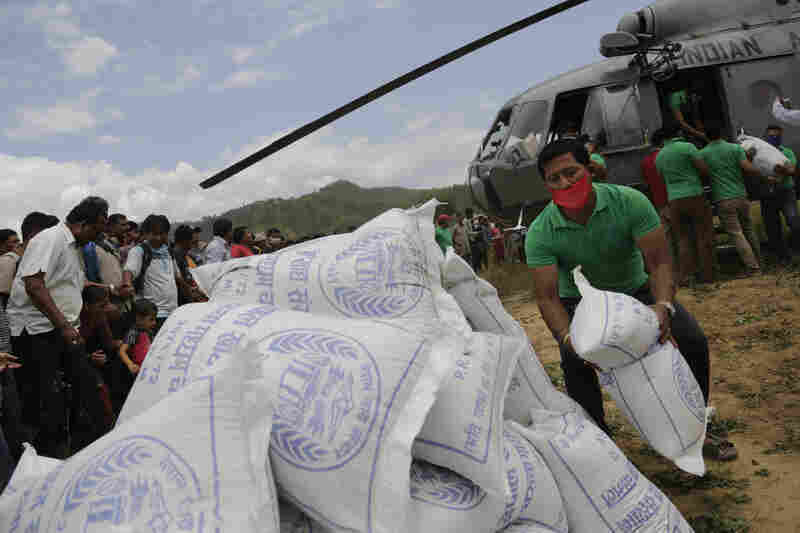 The earthquake has left nearly 1 million children in need of humanitarian aid, according to UNICEF. Nepali soldiers carry an injured man to an Indian air force helicopter as they evacuate victims from Trishuli Bazar to Kathmandu airport. People carry belongings from their destroyed homes as they walk through debris in Bhaktapur, on the outskirts of Kathmandu. 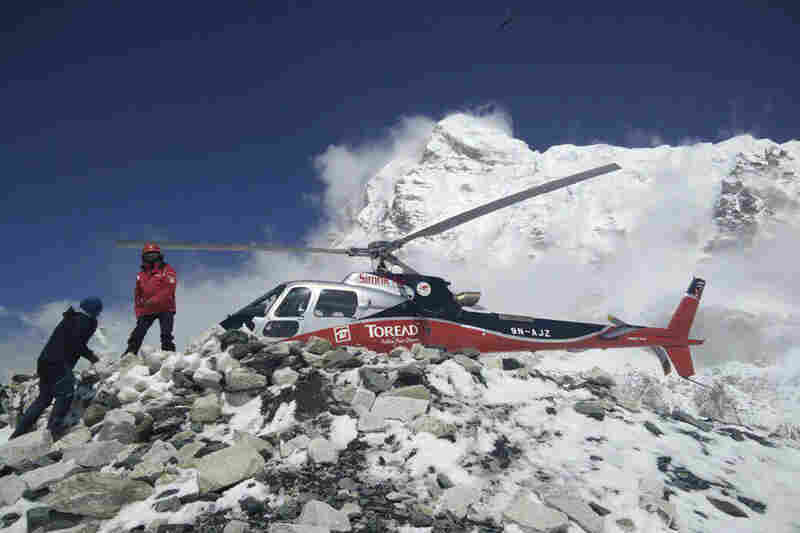 A helicopter was used to try to rescue people from Camps 1 and 2 at Everest Base Camp. The quake also triggered a massive avalanche that buried climbers on Mount Everest, killing more than a dozen people. Nepal's devastating earthquake that hit Saturday is now blamed for at least 4,000 deaths. Reconstruction is estimated to cost billions. International aid efforts are underway, but aftershocks are rattling survivors' nerves and making the recovery even more challenging. Rescue crews and aid groups are working to reach survivors — but their efforts are being hampered by the stricken areas' remote locations. Roads that are drivable are clogged with traffic. Officials warn the death toll could go much higher. The magnitude 7.8 quake has left nearly 1 million children in need of humanitarian aid, UNICEF says. In one district, 400,000 people were affected by the quake and more than 4,000 homes are now unsafe to inhabit, NPR's Julie McCarthy reports. From Kathmandu, Julie says many residents are both angry that more wasn't done to reinforce Nepal's structures against earthquakes and afraid that further tremors might bring more destruction. "Until these aftershocks settle down, people will be terrified of them. News of them just consumes their conversations," Julie tells Morning Edition. She adds, "People tell me they're afraid even to go back into their homes to grab a blanket." As a result, thousands of Kathmandu residents have put up tents in open areas — and now there are new concerns, ranging from a shortage of tents to worries that the food and water supplies might last only until the end of this week, Julie says. 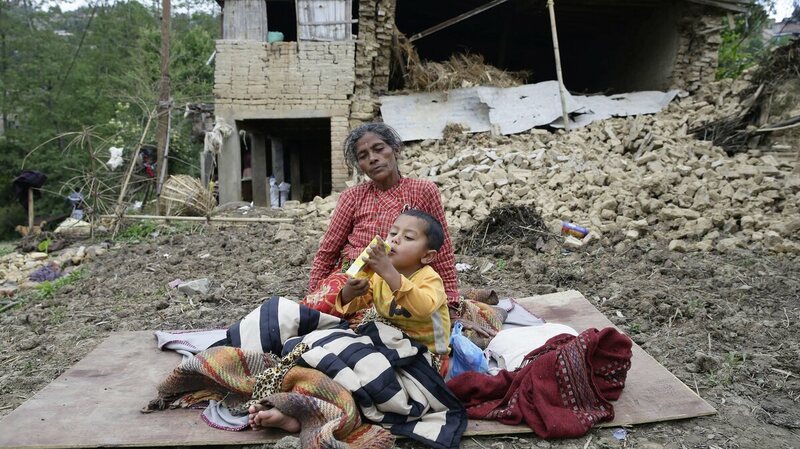 A woman and child rest in the open outside a destroyed building Sunday, a day after a major earthquake leveled homes in Kumalpur village on the outskirts of Kathmandu, Nepal. Nine people reportedly died in the small village, including four children. 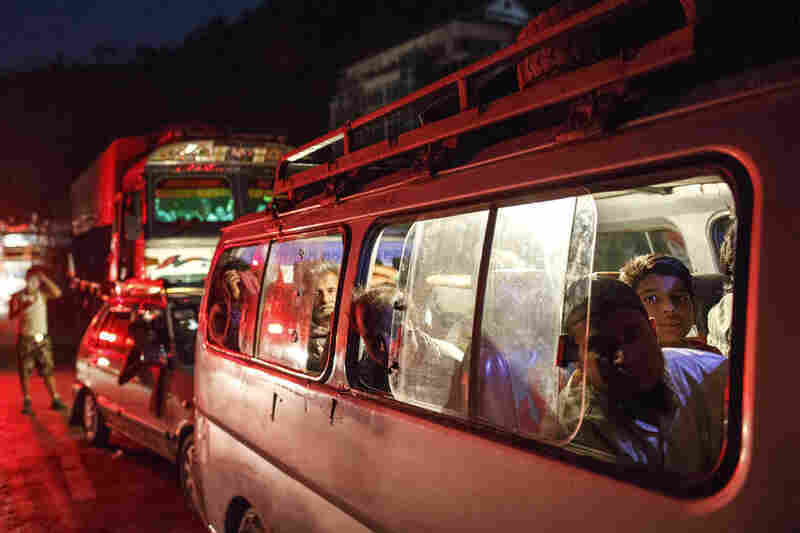 "Roads leading out of the mountain valley city of one million were jammed with people, many with babies in their arms, trying to climb onto buses or hitch a ride aboard cars and trucks. "Huge queues had formed at Kathmandu airport with people desperate to get a flight out." The ancient temples and court buildings of the city of Bhaktapur, a World Heritage site that is just east of the capital, did not fare well, Julie says. "Interestingly, the National Musuem of Nepal was left standing, virtually untouched. It, among many buildings that had rumbled to the ground around it — beautiful wooden structures with intricate carved doors and windows — was untouched, because it had been recently reinforced to withstand an earthquake." The quake also triggered a massive avalanche that buried climbers at the Mount Everest base camp. Helicopter crews have been working to get climbers off the mountain. From the Nepalese capital, NPR's Kirk Siegler reports on the search and rescue effort in the Himalayas. "Ron Nissen, 70, was in a dining tent at the Everest base camp when, he says, the mountain shook. An avalanche of ice and debris came down over him and some fellow climbers. "Nissen walked away with just some scrapes and bruises, but he lost all his gear, money and passport. He managed to find a jacket and he says he and some Sherpas and other climbers hiked down to the nearest village — where he caught a helicopter down to Kathmandu and is looking for help from the Australian Embassy." 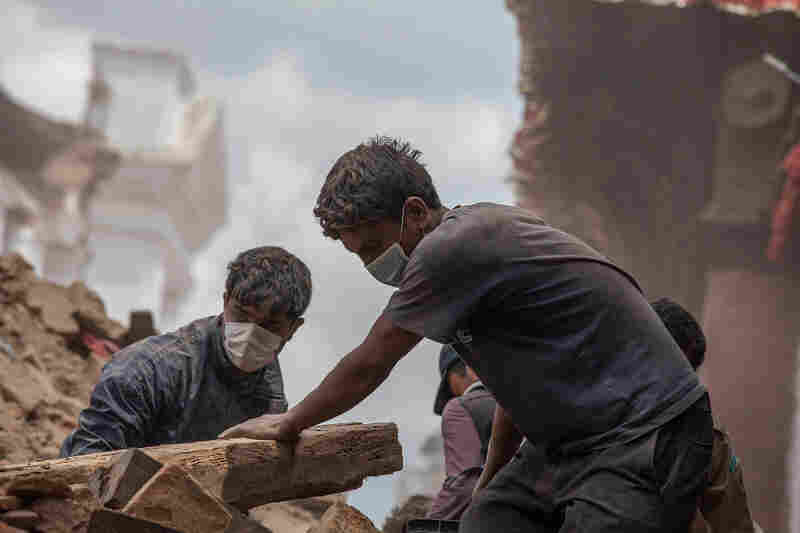 Two of Nepal's biggest international supporters, the World Bank Group and the Asian Development Bank, say they're ready to help the recovery effort. The ADB said Monday that it is sending $3 million for immediate aid, promising an additional $200 million to help start rehabilitation.